VisionX VisionPlus Awards 2016: Excellence Rewarded Yet Again! The optical industry has witnessed another set of new innovation and creativity this year. 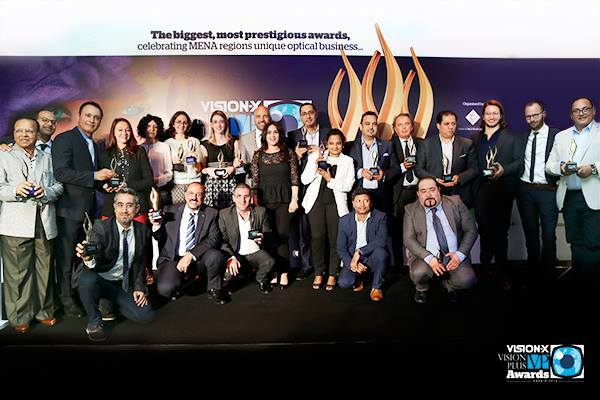 The third edition of the Vision-X VP Awards – a joint initiative between VisionPlus Arabia Magazine and the organisers of Vision-X Dubai, aimed at recognising the best products in the optical industry, the winners were announced at a gala night held on 25th October, 2016. Introduced as a new concept two years back, the awards received an overwhelming response in terms of participation from some of the leading brands in the optical industry across the globe, this year as well. The awards were hosted amidst a lot of excitement and fun that filled the evening as the winner’s league of the optical industry could be seen gleaming with pride. Here is a reminiscence of the moments from the award ceremony of all the participants smiling in awe after receiving the awards. Hosted at the luxurious Dubai World Trade Centre, the Jury Meet saw the big names of the optical industry, like Saeed Emam and Khaled Mahmoud of Magrabi Optical, Mushtaq Ahmed and Mathews Jacob of Yateem Opticians, Rayan Rouhani of Saudi Optic House, Saleh Al Shawa of Al Jaber Optical, Murad of Grand Optics, Ethan Shafiei and Joseph Ibrahim from Qatar Optics, coming together to access the various entries in each category. The atmosphere was nothing less than exciting as the experts from the optical trade convened to identify the latest trends and put together the nomination from the pool of entries received in each category. shortlisting the best in eyewear and eye care technology that the opticians in the Middle East should be voting for! Hundreds of entries spanning seventeen different categories passed through their expert scrutiny. The top 5 products in each category were announced as nominees and were available for online and offline voting. “VXVP Awards is a great initiative and it has surely helped in raising the bar for eyewear products in the Middle East. This year, the collections we analysed was indeed very impressive particularly the luxury segment where we saw some really impressive entries. Indeed I am very happy to be a part of the event”, said one of the jury members. The primary focus of the Jury Meet was on ensuring that all products were reviewed by the best in the industry and by those who truly understand the criteria on which a product should be assessed. Thanks to the unique algorithm that VisionPlus Magazine has created and successfully implemented over the years , every product got its points based on criteria that were unique to the particular category. The analysis by a panel ensured that there was no bias being exercised towards any of the entries. The sophisticated pairing of titanium with distinguished diamond like carbon block from the house of Silhouette is a dynamic design for the modern day wearer. The stylish eyewear features a full rim design. Incorporation of design elements make it a worthy choice for modern day wearer. Urban Fusion is a merger of best Silhouette product features with pure and streamlined design. The connection of high-class SPX and Titan builds a strong yet lightweight frame. Original style (Clubmaster + Round), authentic design (rivets & coined bridge) & unique new colors and lenses define the look of a new icon – Clubround. Limited edition Bentley sunglasses made with Platinum and diamonds, this piece is completely handmade. The temples are shaped by two gold tubular metal bars that are embracing the lenses on the front. Engraved Chloe logo is positioned on the left temple. The Lindberg Sun collection also features the brand’s patented screw-less hinges and the world’s premier ZEISS glare protective lenses which is similarly why Lindberg only works with specifically trained retailer partners. Creating an original style, authentic design and unique new colours and lenses by reinventing an iconic shape using the round trend. Iconic shape, classic material, unisex appeal and Ray-Ban DNA details define the unique identity of this new Icon. The sunglass is a sports model. Thanks to its unique folding feature, the sunglass easily fits into the pocket making it an excellent choice for the modern day wearer. The model is a part of optical collection aimed at girls aged between 4 to 10 years. This model comes in acetate material with ‘obe’ flex spring hinges. A hello kitty case is comes with each frame. The new series is made using latest advances in optics and the deep understanding of wearer’s physiology. The lens uses Nanoptix and Synchon Eyes, the two technologies that underline the extraordinary benefits of the Varilux S series. Transitions Signature VII is the most balanced adaptive lenses designed to adapt from clear indoors to dark outdoors in an easy manner. They easily adapt to the changing light to suit the needs of the wearer. Crizal’s latest innovation is the only clear lens in market to filter harmful light while maximising essential light including healthy blue light. It improves visual comfort due to constant improvement. The lens are specifically designed to maintain natural moisture level. It prevents the eye from feeling tired and irritated. The lens guarantees comfortable vision all through the day. The best selling contact lens is popular due to its unique 3 in 1 technology. The cosmetic lens provides natural color change for every patient. A special range of Hoya EyeGenius lens designs helps to correct fixation disparity at the highest rate of adaptation. In this way, Hoya offers a complete vision examination system, from refraction to prescribing exactly the right lenses. Key Features of SE-9090 Supra System include faster grinding with dual spindle system, simultaneous dual-side lens measurement, high quality automatic polish safety beveling, improved durability and accuracy and user-friendly.